The Phoenix Alumnae Club of Pi Beta Phi Fraternity for Women recently received the Fraternity’s highest and most prestigious honor, the Premier Club of Excellence Award. The Phoenix Alumnae Club of Pi Beta Phi® Fraternity for Women restructured its officer positions last year to promote delegation and involvement, including adding an assistant communications role to focus on social media. All club events were specially designed to increase involvement and focus on fun, friendship and philanthropy (submitted photo). 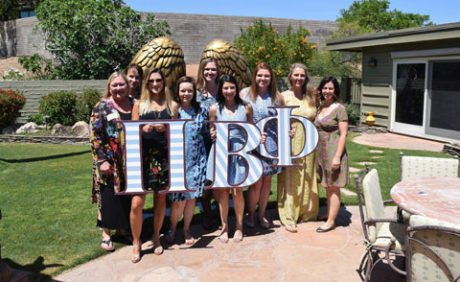 Pi Beta Phi alumnae clubs promote and support philanthropic endeavors, assist collegiate chapters and offer friendship to new graduates and alumnae. One large club and one small club, among nearly 300, are chosen each year as representatives of performance that is exemplary above all others. The Phoenix Alumnae Club boasts an impressive number of engaged and enthusiastic members. More than 50 percent of those members participated in the club’s philanthropic initiatives last year, contributing more than 670 literacy-related volunteer hours, $4,000 in-kind book donations and $1,490 in other contributions to support literacy projects. Additionally, the Phoenix Alumnae Club raised nearly $7,000 for The Literacy Fund at Pi Beta Phi Foundation. The Fund plays a critical role in the success of Pi Beta Phi’s philanthropic effort, Read > Lead > Achieve, which promotes a lifelong love of reading.